Ferrer-Arnau, Ll. 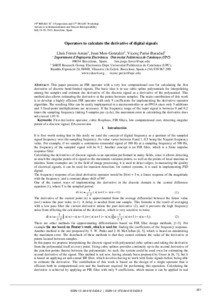 ; Mon, J.; Parisi, V.
This paper presents an FIR operator with a very low computational cost for calculating the first derivative of discrete band-limited signals. The basic idea is to use cubic spline polynomials for interpolating among the samples and estimate the derivative of the discrete signal as a derivative of the polynomial. This method also allows estimating the derivative at the points between samples. The main contribution of this work is to develop a highly efficient FIR operator with only 9 coefficients for implementing the derivative operator algorithm. The resulting filter can be easily implemented in a microcontroller or an FPGA since only 5 additions and 3 fixed-point multiplications are necessary. If the frequency range of the input signal is between 0 and 0.2 times the sampling frequency (taking 5 samples per cycle), the maximum error in calculating the derivative does not exceed 1.03 %. Ferrer-Arnau, Ll. ; Mon, J.; Parisi, V. Operators to calculate the derivative of digital signals. A: IMEKO World Congress. "Proceedings 19th IMEKO TC-4, Barcelona, Spain Universitat Politècnica de Catalunya July 18th and 19th, 2013". Barcelona: 2013, p. 301-306.